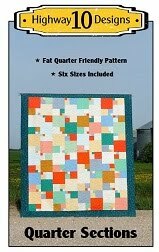 This is Donna’s Quarter Sections quilt that she made in childrens fabrics, so cute! Love the orange, blue and greens with the animal prints. 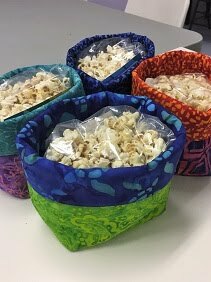 We chose Popcorn for the pantograph and Dream Blend for the batting. I used yellow So Fine on the top and yellow Bottom Line on the back. The backing is hand dyed by Leslie from Keystone Quilts in Winnipeg. It is soft flannel in shades of yellow to bright orange. I also quilted a small baby Quarter Sections quilt for Donna as she is waiting on a new grandbaby to arrive! The panto is Chantily Lace, batting Dream Blend and the backing a beautiful pink Fireside. Pink So Fine thread on top and pink Bottom Line for the back. This is Iris’s Kaleidoscope Kite quilt and it is a free pattern on Fresh Lemons website here. The backing is a bright green Minkie so I thought Dream Puff batting would be a good match for this quilt to make it fluffy and light! I also find when I use Puff batting the Minkie does not beard up to the top of the quilt. I chose a light density panto called Fascination and white So Fine thread. 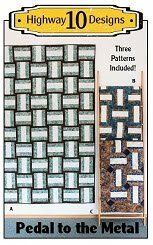 This is Lynn’s Quarter Sections quilt made using our Highway 10 Designs pattern. I love the combination of blue, yellow and grey Lynn used in her fabric choices. Lynn asked for Bayside for the panto and used Quilters Dream Blend batting. Thread is a light grey So Fine with a medium grey Bottom Line for the back. The lake ice is about 12” to 18” thick now so I’m not venturing too far. Welcome to our guilds 2016 Quilt Show, this is the reason my blog as been so quiet this past month. I was co-chair of the show along with my good friend Audrey. I thought I would share pictures of our show with you and I’m sure you will recognize many of the quilts as I did the count and I quilted 40% of them. These ladies are the reason I have my longarm business and I’m very grateful they have trusted me with their quilts over the years. I would not have developed the skills I have without their support. Our show is held in our Community Hall as it is the largest suitable venue in our town. We have 6 large quilt trees that each hold 8 large quilts, a cable on the west wall that holds 18 twin, lap size quilts and we made PVC frames to hold large wall hanging and baby quilts. We include a tea and cookies with our show and a place for viewers to sit, chat and enjoy the atmosphere. We have two entrances so have two admissions desks, this is the view from the second entrance and you are welcomed with our Lug Nuts Raffle quilt this year and our guild banner. We also had In House raffles which was three quilts and one tuffet. We had a guild challenge this year, it was Black and White Challenge and members also had to pick a marker out of a bag (while not looking) and the colour they picked was the only accent colour they could add to the Black and White fabrics. We had 25 entries and had the show viewers vote for their favorite. The winner was Rae’s “Whoops” quilt. And third was my Hunters Star quilt. We each received a fabric ribbon and a quilt kit. Now lets wander around the show a bit! We had a special display from our guild members Robin and Nadine. They have been very busy making quilts for Ronald McDonald house in Saskatoon, SK and focused on quilts for teenage boys as that was the kinds of quilts the charity was always short on. They are not anymore as I think they have made between 80 to 100 for that project. We are very proud of you ladies and that is what quilting is all about! We also had a Toonie Parade fundraiser were members donated baskets or new items and these two lovely ladies, Moira and Iris, created 16 beautiful baskets and a gorgeous display. Great job ladies! If you’re wondering why it is called a Toonie parade it is based on the same idea as a Penny Parade and when we started the tickets were $2 ( in Canada that coin is called a Toonie). But now that we have change our ticket to a sheet of 20 for $5 we might have to change the name! Now besides seeing all the quilts having two vendors at our show is a huge highlight for us as we do not have a local quilt shop. So Mami’s Country Quilts from Duck Lake, SK filled the stage with their beautiful Judy Niemeyer quilts as they are certified teachers for her patterns. Had to get a closure picture of their Lug Nuts quilt sample under this beautiful Judy Neimeyer quilt! We also had Road 17 N Quilt Shop from Winkler, MB drive 900km to come to our show! Thanks from coming to our show Shari and Leroy, we hope you come back again for our next show! And last, but not least, our Viewers Choice Red Ribbon went to my client Linda for her beautiful Sunday Ride quilt which will be a wedding gift for her granddaughter! Congratulations Linda! Now that I have my blog post done I plan on doing NOTHING for the rest of the day! I hope to be back to my regular quilting and blogging schedule this week now that the show is over. 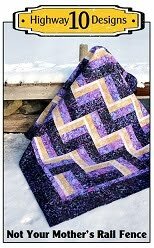 This is Terry’s Broken Herringbone quilt and the pattern is by Violet Craft. I love the fabrics she used but don’t know the name of the collection. 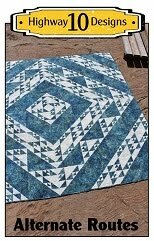 She asked for simple quilting so I thought this would be a good time to try a new pantograph called Water Wings by Barbara Becker, which I purchased from Urban Elementz. The thread is beige So Fine and batting Quilters Dream Blend. Now that the weather has warmed up we have been watching the otters playing out on the ice! But of coarse as soon as I get my camera out they disappear. So I went for a walk out on the lake (there is 24” of lake ice so still safe) and found the opening where they are popping in and out of. They were not too happy to see me approach and starting making a snorting sound. Then they tried to hide! But this is my favourite picture. I was getting pretty close so one of them disappeared and suddenly popped through the ice and started snorting again! I was prepared to run but I had to get a picture first and it was worth it! This is Sheri’s City Slicker quilt and it is the second one she has made. 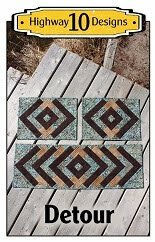 This time she used a jelly roll from a Moda line called Little Black Dresss and a light Grunge for the background, it looks fabulous. This was the same fabric that Road 17 N used for their City Slicker sample and has kits made up if you’re interested! We finally have above freezing temperatues so the snow on the lake is melting like crazy. I froze again last night so I was able to run out there this morning to get a few pictures on the ice. Probably won’t get many more of those this year! Sheri requested the Mimosa panto and it looks great on this quilt. I used a medium beige So Fine thread on top, a ligher beige of Bottom Line on the back and Quilters Dream Blend batting. The backing is a wide Grunge in the lightest colour they make. Feels good to be back at the longarm after a week off. When I came home from the Quilt Show my house was torn apart and my Shack full of furniture as we were getting new carpet installed. When my husband ripped out all the old carpet he said he found a beach under the it! Yes, piles of sand had collected over the years and now we know what all the lumps were under the carpet! He swept up a few piles like in this pictures just in the livingroom. Here is the new carpet! Much nicer colour for taking quilt pictures on than my old teal carpet…and it will hide the sand!